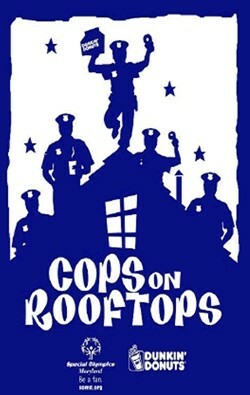 Day 168: Cops on Rooftops at (Where Else? )Dunkin Donuts! On Saturday, August 20th, 2011 the St. Mary’s County Police Department will be holding a fundraiser at the Dunkin’ Donuts located at 22861 Three Notch Road in California, Maryland. Ordinarily, this wouldn’t be news. When ISN’T there a cop in a donut shop? Finding a cop at Dunkin’ Donuts is like finding sand in a desert! All joking aside, these cops are going to be at Dunkin’ Donuts for reasons other than waistline expansion. It’s all part of a fundraiser for the Maryland Special Olympics. From Saturday morning to Sunday morning cops will be in and ON the store to raise money and awareness for the cause, so check it out! customers and the general public are encouraged to stop by and support the officers and Special Olympics. Along with the rooftop Deputies other volunteers will greet customers inside and outside of the store. Donation jars will be placed inside of the Dunkin’ Donuts for those who wish to contribute to this worthy cause. In 2010, the Maryland Law Enforcement Torch Run was named the top fundraising program in the world at the annual Torch Run Conference. For further information please contact Detective Corporal David Alexander or Corporal Brian Hartz at david.alexander@stmarysmd.com, brian.hartz@stmarysmd.com, 301-475-4200 ext.1954. We hope to see you this weekend at Dunkin’ Donuts.